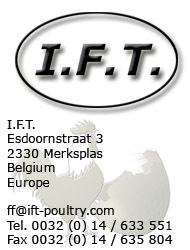 The planning and organisation of set-up programs of parent stock rotation of broiler farms and layer units. The set-up of a organised planning system in which the needs and quality of the end products will be the guideline. The elaboration of a year and multi-year planning subject the moment of set-up of parent stock. The quantities of parentstock per flock. The set-up of a precise hatchery planning. The set-up of delivery program for day-old chicks. The elaboration of a routing for transport of products. The needs for raw materials. The needs for all different health products. The set-up and planning of training programs.